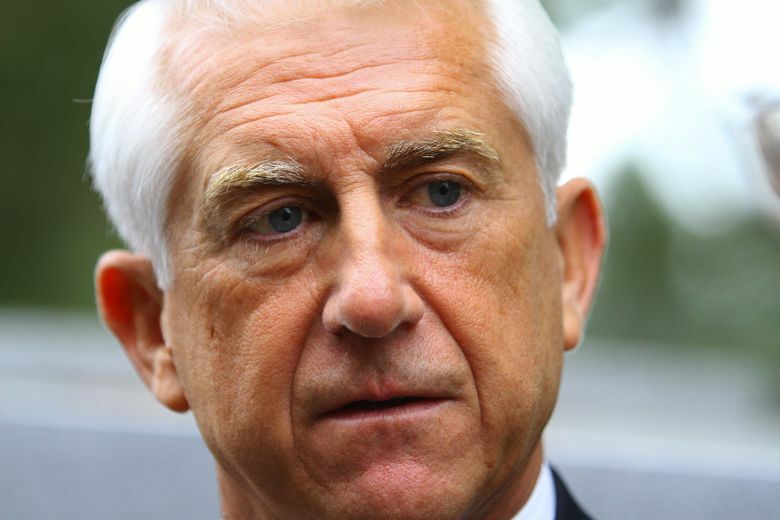 Protesters continue to hound U.S. Rep. Dave Reichert over his steadfast refusal to hold a town hall. One tactic: Shadow the Auburn Republican to public events and make a scene. Protesters continue to hound U.S. Rep. Dave Reichert over his steadfast refusal to hold a town hall. One tactic: Shadow the Auburn Republican to public events and make a scene. That’s a plan laid out by activists for his scheduled appearance Monday at the Washington Trade Conference at Seattle’s Westin Hotel. The Seattle-based Fuse Washington has planned a protest outside the hotel — and offered to pay the $175 to $225 cost of conference tickets for volunteers willing to go inside and “disrupt” the event, according to an email circulated by organizers. “Per the Indivisible Guide, if our Member of Congress isn’t holding town halls, we must take the message to any public events!” said the email sent last week by volunteer activist Summer Montacute. Aaron Ostrom, Fuse’s executive director, said there’s nothing nefarious about his organization’s covering the cost of entry to the conference for some of Reichert’s constituents. No matter what activists do, Reichert has indicated he won’t change his mind on town halls, which have been a time-honored tradition for many members of Congress. He is the only U.S. House member from Washington who has refused to hold the events going back years. Reichert’s office says he has met instead with smaller groups of constituents, including members from “Indivisible” groups organized to resist the Trump administration. Last week, he met with members of Indivisible Wenatchee for nearly two hours and took “all their questions,” Reichert said in a Facebook post. Other Republicans, and even the White House, have claimed paid protesters are responsible for the recent rounds of disruptions at GOP town halls. The fact-checking organization PolitiFact has rated those claims false. In many ways, the current round of liberal protests is the flip side of the conservative tea-party movement of around 2010. Then, as now, protests were organized by political groups but also grew organically. Fuse helped organize the protest outside Reichert’s Issaquah office last month that drew between 500 and 700 people, according to police estimates. While several Fuse staffers set up details of the event, including getting the protest permit, Ostrom said the vast bulk of the people who showed up were Reichert’s constituents. “They’re not getting paid,” he said. These days, Ostrom said, it’s not even particularly difficult to get hundreds or even thousands of regular folks to show up to protest Trump and the Republican Congress’ plans to repeal the Affordable Care Act. “The quantity of motivated volunteers is like nothing I’ve ever seen in my life,” he said.